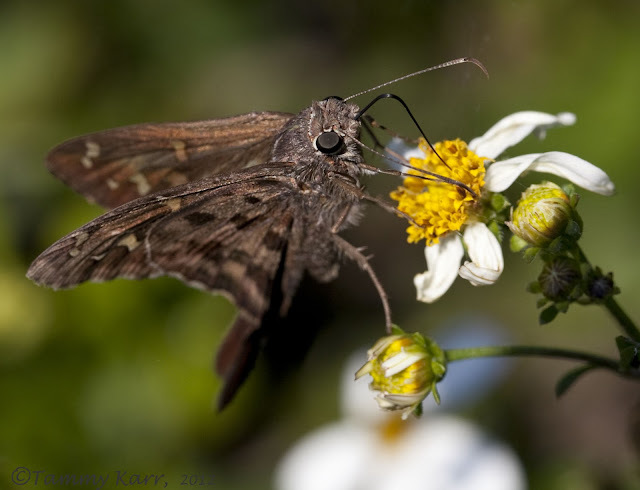 i heart florida birds: Butterflies, Bees, & Moths, Oh My! Passing through the local ponds to check out the birds has been a regular activity of mine for quite some time. Only recently though, have I started to take a closer look at some of the other creatures that dwell there. The perimeter of the ponds is lined with trees and fencing that is heavily blanketed with an assortment of vines and weeds. The variety of blossoms attract many different species of moths and butterflies that can be seen here year round. When I was there over the weekend, I noted several small areas that had dozens of Zebra Longwings sipping nectar from the available flowers.This butterfly, which is one of the most abundant species found here, is Florida's official state butterfly. 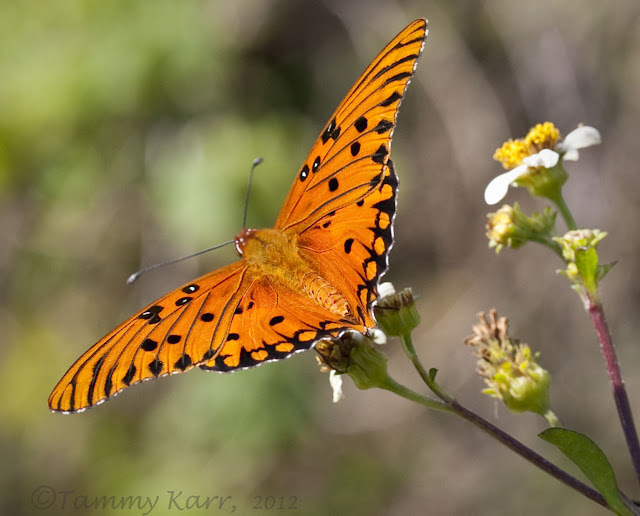 Gulf Fritillary butterflies are also popular here. This was one of the most vibrant ones I encountered on my visit. As I was kneeling in grass, this worn looking Gulf Fritillary land nearby. 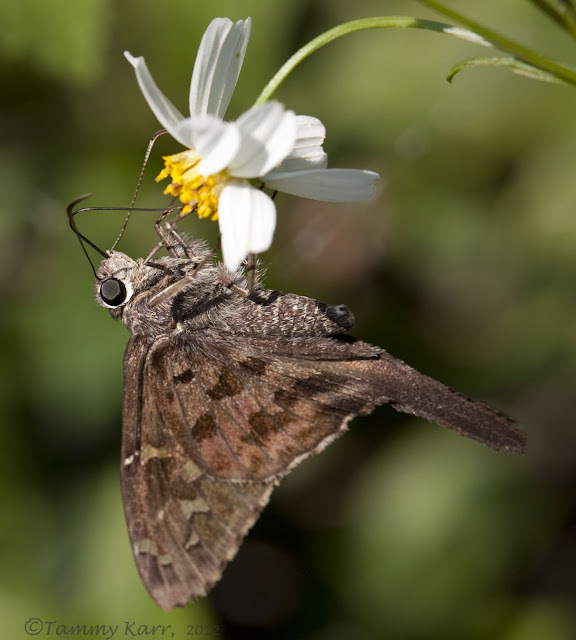 The butterfly sat motionless for a few moments, then began to curl its body into a strange position. It took me a moment to realize what I was observing. 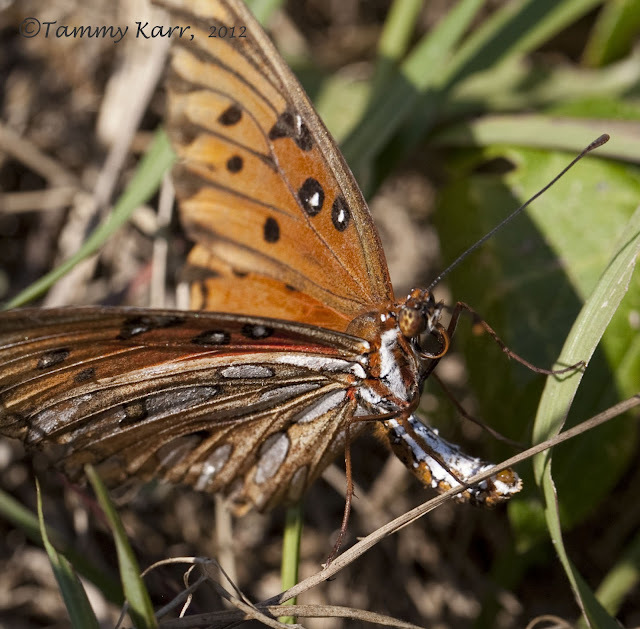 I then realized that this butterfly, as it curled up its abdomen, was laying a tiny egg on a barren stick. I've never actually watched a butterfly lay an egg, but it was pretty fascinating to see this unexpected occurrence happen right next to me. 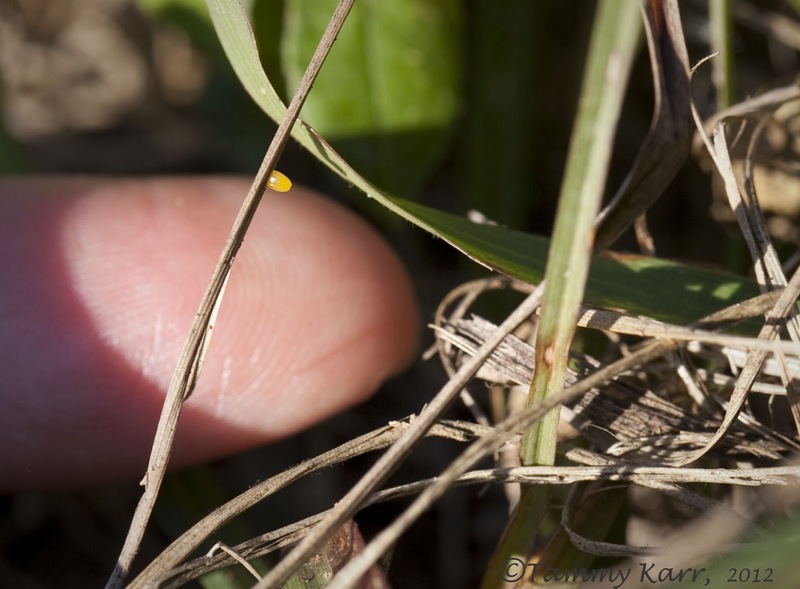 After she flew off, my son and I examined this tiny egg. The stick seems like an unusual place for an egg to be laid as Gulf Fritillary usually lay their eggs on the leaves of the plentiful Purple Passionflowers that are here. Beautiful close ups, great photography. Some of the best close-ups that I have seen! Oooh fantastic critter shots. Must have been pretty crazy to see that buttefly lay an egg! 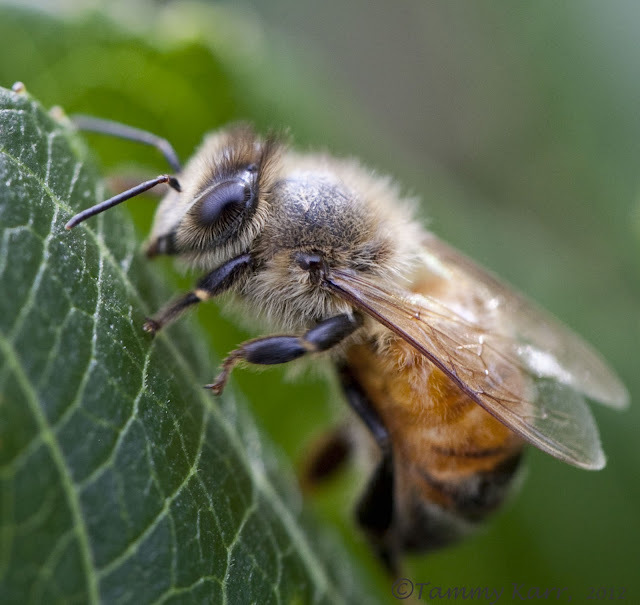 That spider gives me the creeps a little bit, I think the bee is my favorite. Preciosísimas fotos macro amiga Tammy, más aún sabiendo su dificultad. von der Spinne ist klasse. Beautiful pictures Tammy, nice close-ups, quite sharp, compliments. So exciting Tammy, you've given me so much to look at! 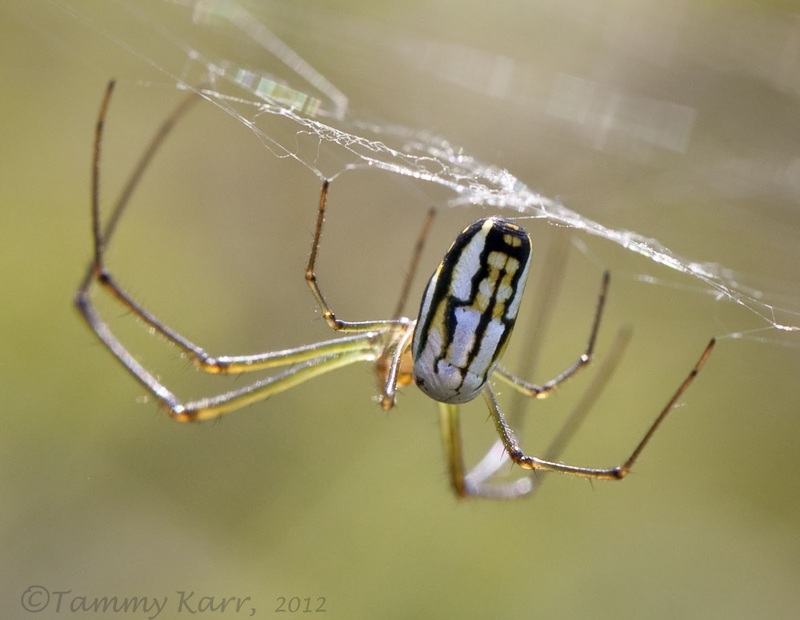 Love the Zebra Longwing (I've never seen one before) the angle of the spider shot (Awesome!) the clarity of the bee shot, the grasshopper (can't help but think of Hopper from Bug's Life) and the dragonfly - super viewpoint - I Heart It! 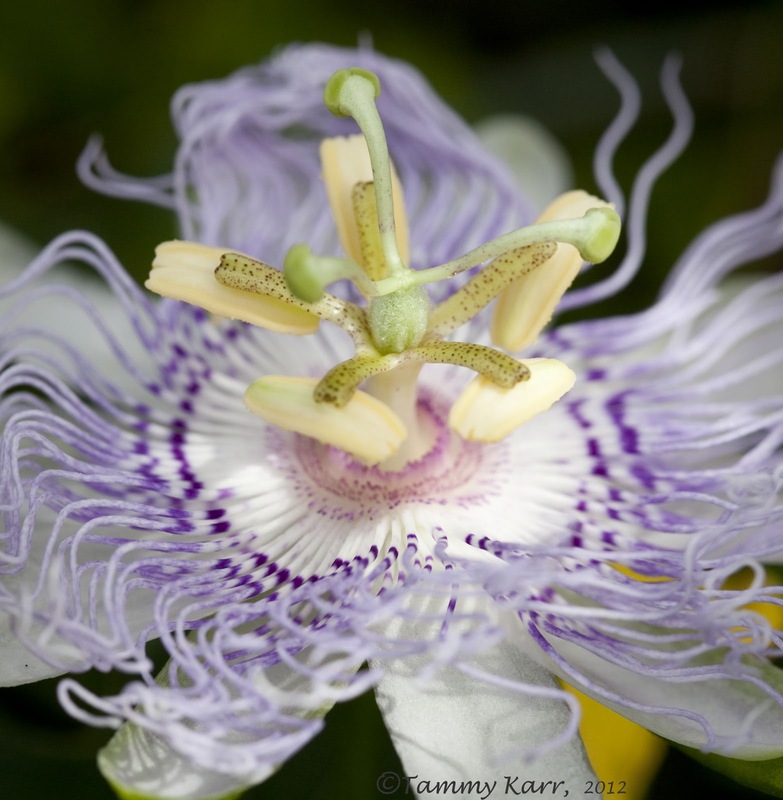 Great macro shots Tammy! I think the flower is my favorite. Whoa. Is this a new lens? Great results. Can't say I've seen a butterfly lay eggs before, that's pretty sweet. It is a new lens:) Santa brought me an early gift this year. It is a lot of fun to play around with. These are beautiful! I've never seen a butterfly lay an egg. Very cool! 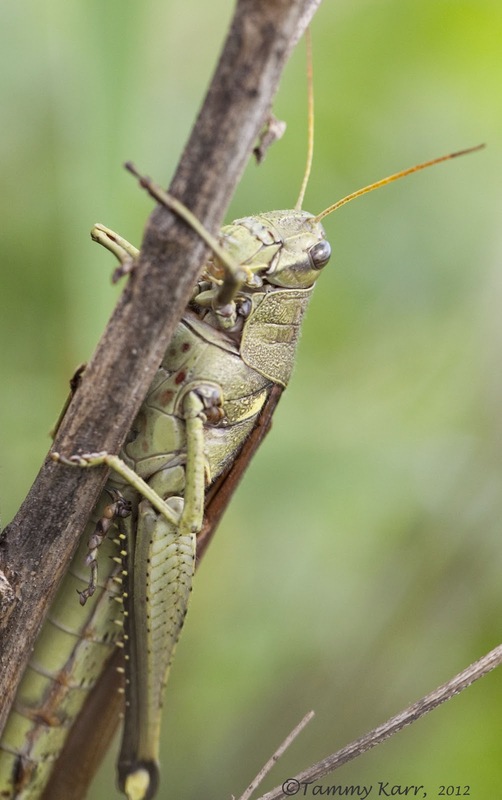 I love the bee, grasshopper, and dragonfly! I'm glad somebody still has these things around. Awesome pictures Tammy, one more beautiful from the other!! Oh my!! is the right sentence.. heartly compliments for the work you always share with us!!! Gosh you have some of the best macro shots ever now, is there anything that you cannot do Tammy. (I wanted to mention that your tiny avatar of you standing on the beach with your little boy beside you is so amazing, how wonderful for him to be beside you as you take all these wildlife shots. )Anyway that shot just tugs at my heart. What a terrific post Tammy. Love the macros. 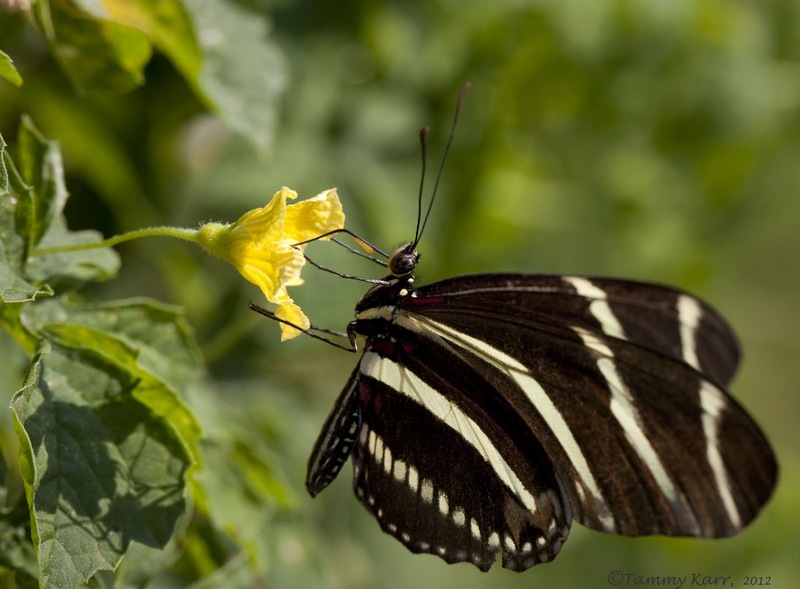 How fortunate to see a butterfly lay an egg. Now we have seen it too. Thanks. Great macro photos showing us, technically on top. I enjoyed the whole series very well. I got great shots last April in Central Florida too. The bee and spider are very nice! Oh my.. is right, Tammy. I love where we live but sometimes I envy the area you live and play in. Take up a close watch and we find treasures. Blog hopping and I find surprises. You sure know how to skip from one subject to the next! Congratulations for these pics, I love them! The sipper has a very fancy double tail that none of ours have, how handsome! 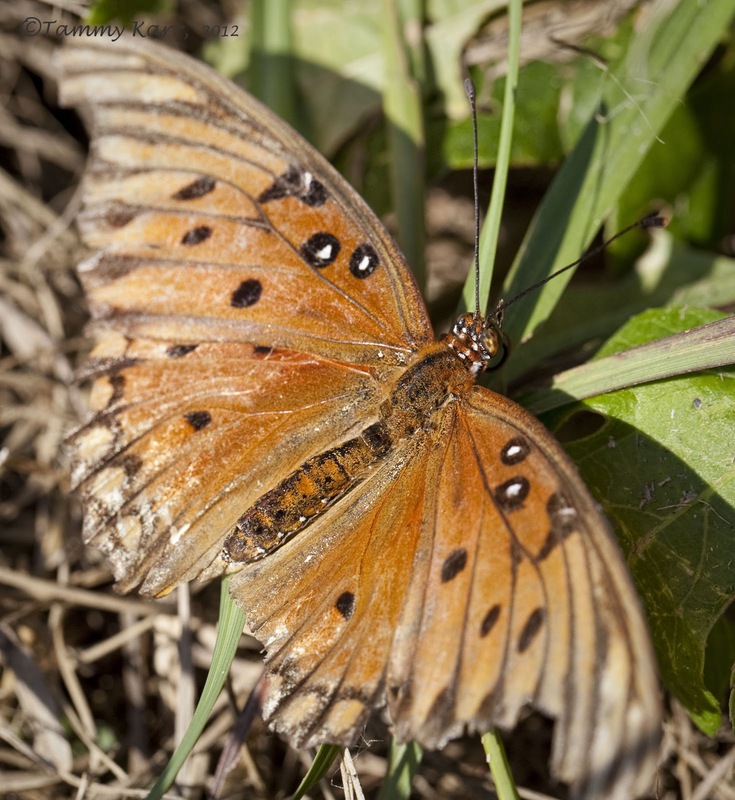 The fritillary resembles our spanish one but with less black dots! 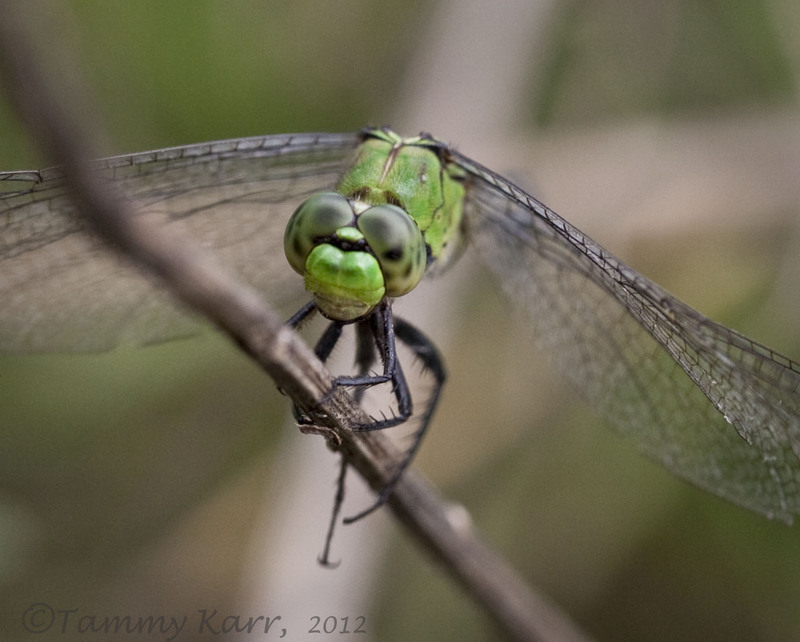 And you can add as many dragonfly photos as you wish, I just love to discover your species! Bonitos macros, Tammy, buenos acercamientos.